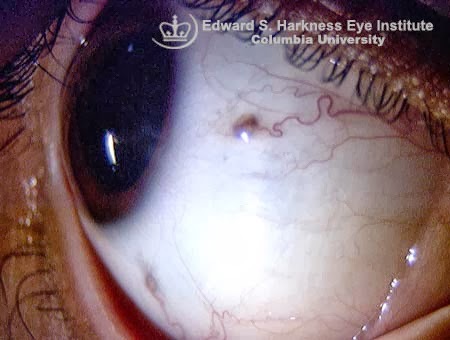 A nerve loop of Axenfeld is a normal, often pigmented loop found in the sclera (white ocular tissue) where the posterior ciliary nerve comes very close to the scleral surface before it loops back through the sclera and then into the ciliary body. In many cases there is a slight elevation to the area as the nerve loops back into the scleral tissue. 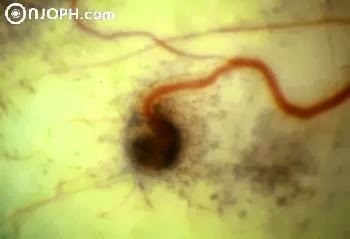 The pigmentation of the area may increase with time, and is commonly faint, giving a "purple" appearance instead of brown or black. These areas can never result in melanoma, or any other cancerous or infective condition, and do not need treatment. Unfortunately, many of my patients fear that these areas are signs of damage from pencils being poked at the eye by a classmate (usually a colored pencil of course). Apparently pencil poking is still quite common in today's younger generation. And apparently my office is not the only eye care specialist that gets these questionable pencil foreign body questions. There are multiple reported cases of these normal nerve loops being mistaken for entrapped graphite pencil tips. Sigh of relief, if you have this, you are just a normal person after all. But if you get poked by a classmate's pencil, probably best to still get it checked out by your eye doctor! I have a very strange case, first a stye appear on my lower left eyelid. The about a month after that a chalazion apearred on my lower right eyelid. After the chalazion started to shrink I noticed 2 nerve loops in the white of my eye, and today another nerve loop appeared in my left eye. Other then some slight concern I can still see perfectly. And nothing else seems to be wrong, should I be worried? Nerve loops of Axenfeld don't typically develop, so this may be something else. Best to consult with your doctor!